Today's TRUST story comes from my brother, Daniel McIntosh. He and his family are missionaries with Kentucky Mountain Mission in Southeastern Kentucky. Thank you for sharing, Daniel! I recall back in the 1970’s, living in southern Minnesota, and visiting a park with family and friends. This particular park had flat lands, cliffs, caves, and even a large flowing river. I was around the age of 9. My older sister, a couple friends, and I went on a hike in the woods. There was a part of the trail we could continue on, or we could hop across a bridge over the river where the path split off into two more directions. We hopped across the river and, after a time, the friends wanted to separate and go their own direction - a direction our parents told us not to go alone and without adult supervision. In the process, everyone got lost. We couldn’t find the way back to the picnic area, and fear began to creep in. I recall wondering if I would ever find my way out and back to my parents. About that same time, I realized I needed to pray - and pray I did. I called out to the Heavenly Father in prayer asking for help, to show us the right direction back, and to be reunited with the rest of our family again. No sooner was my prayer over and the Lord brought to my mind the flow of the river. What direction did it flow when we entered the woods. What direction was it flowing now, and on which side of the river were we standing on now? When I was able to piece all of this together, I knew exactly where to back track on the path, cross the river, and head back to our family and friends. I shared it with my sister, we were able to cross back to the main path and, shortly after that, our friends could be seen across the water - still lost. We called to them and told them how to get back to our side. Then, we all walked out safely from the woods, back to everyone still in the picnic area, just in time for supper. Until I called out to God, trusting Him to help us find our way back, we were lost. But in that moment of trusting Him, and asking for His guidance, He helped me realize what path I needed to take and how to get to where I needed to be. Everyday life is much the same way. We need to trust God for the small and big things -what college to go to, what job to take, where to live. 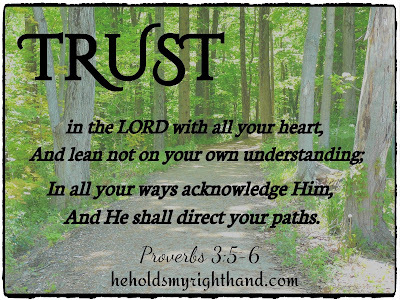 Every task and routine in life should be accomplished through trusting Him first in it all.